​Our recent exploration of 2015’s historically weird NFL scores took us deep into the world of NFL kickers. 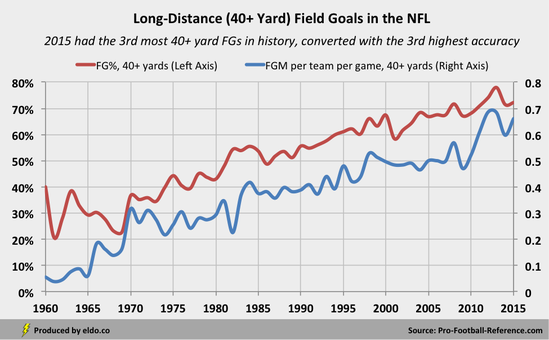 There, we saw how field goals (FGs) evolved from infrequent and inaccurate into a significant and reliable scoring phenomenon that now accounts for over 20% of all NFL points. 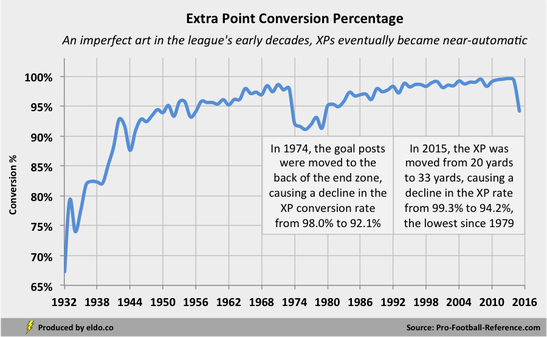 We also saw how extra points (XPs) went from an imperfect art in the league’s early decades to nearly automatic in the 1960s-1970s and 1990s-2000s, each time resulting in a league-imposed change to the XP distance. The 2015 regular season featured the fifth most FGs per game in NFL history (1.63 per team per game), the third highest FG accuracy of all time (84.5%), the lowest XP conversion rate since 1979 (94.2%), and the most two-point conversion attempts since 1998 (0.18 per team per game). As became our refrain, this perfect storm of variables -- having never before occurred at these levels at the same time -- produced the weirdest scores in NFL history. Now, at the start of the NFL playoffs, we wonder whether it might also produce some of the weirdest, most heroic, or most devastating outcomes in NFL playoff history. 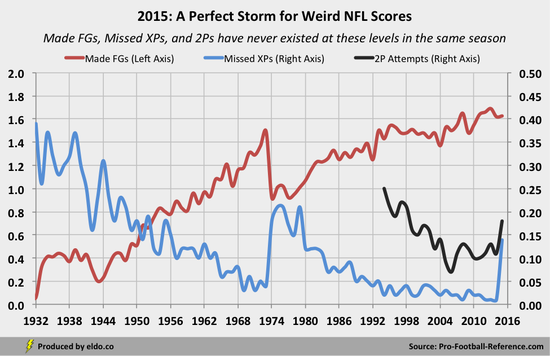 ​Simply put, kickers have never been this good at FGs and this bad at XPs at the same time, and we’ve never seen this combination play out with stakes this high (elimination) or in this context (XP expectations, viewership, social media). As a result, the chances for a kicker to become a hero or goat – already elevated in the playoffs – are higher than ever before. So who is it going to be? Below, we’ve plotted the 2015 XP and 40+ yard FG conversion percentages for each of the 12 NFL playoff kickers. Kickers in the top-right (Gostkowski, with Crosby, Nugent, Hopkins, and Boswell kind of lurking nearby) performed well this season in terms of both XPs and long FGs; they have a lower probability of becoming a goat (blowing an XP) and a higher probability of becoming a hero (converting a long FG). Kickers in the bottom-left (Catanzaro, Novak) have a higher probability of missing an XP (goat) and a lower probability of making a long FG (hero). 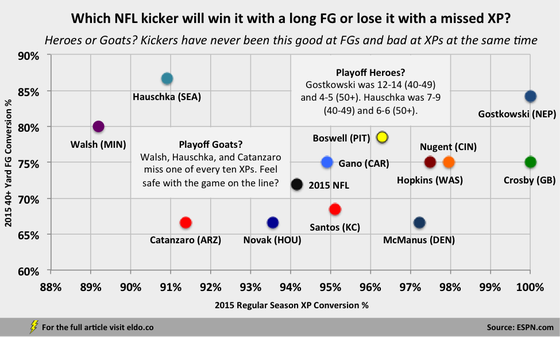 ​Walsh (89.2%), Hauschka (90.9%), and Catanzaro (91.4%) are well below league average for XPs (94.2%). If regular season trends continue, they will each miss one in ten XPs, or about one every three to four games, should their teams advance far enough to allow for it. Interestingly, Walsh and Hauschka performed poorly in 2015 on XPs but kicked very well from distance, at both 40-49 yards and 50+. So while they run the risk a big XP miss, they are also prime candidates for long-range heroism. [In their Wild Card game, Hauschka converted the game-winner from 46 and Walsh missed from 27, a little shorter than an XP.] McManus is their opposite -- very good on XPs but unsteady from long-range. Overall, NFC playoff kickers are better than their AFC counterparts and league averages in FG% and 40+ yard FG%, but they are worse than the AFC and league averages in XP%. The average NFL kicker missed one XP every 7.2 games this season; with two teams (and kickers) in each game, there was one missed XP every 3.6 games. These six NFC kickers missed one XP every 5.6 games, meaning that if trends persist, they will combine to miss one every 2.8 games in the post-season -- or around two total -- depending on which teams advance. Meanwhile, with XP studs like Gostkowski (zero misses in 2015), McManus (one), and Nugent (one), AFC playoff kickers are better than the NFC and league averages in XPs. If regular season trends persist, they’ll combine to miss one every 6.4 games in the post-season -- or around one total. Past performance does not guarantee future results, but if these kickers perform as they did in the regular season, we can thus expect around three missed XPs over ten playoff games and the Super Bowl. We don’t know for sure if it will happen (maybe they’ll be more locked in in the playoffs, or maybe only the studs will advance) and we certainly don’t know if it will ultimately impact a game’s outcome. But because of their constant evolution and the league’s response to it, NFL kickers are set to become playoff heroes or goats like never before. ​The data sources for this article are pro-football-reference.com and espn.com. Data was compiled and analyzed by ELDORADO. All charts and graphics herein were created by ELDORADO.